49ers GM Trent Baalke said defensive lineman Ray McDonald had a pattern of poor decision making, which could no longer be tolerated. SAN FRANCISCO (KGO) -- The San Francisco 49ers cut Ray McDonald on Wednesday after a claim of a sexual assault. It was just months ago that McDonald was accused, but never charged, in a domestic violence incident involving his fiancee. "Ray demonstrated a pattern of poor decision making that has led to multiple distractions for this organization and football team that really can no longer be tolerated," 49ers general manager Trent Baalke said. The 49ers say they are done dealing with McDonald. He is now at the center of a sexual assault investigation. Police searched McDonald's house in San Jose, the same home where he was accused of an assault in August, but not charged. The 49ers front office simply said enough is enough and they cut McDonald. They said this wasn't about due process, this is about accountability for one's actions. McDonald has not been charged or arrested. Police are simply conducting an investigation that is automatically triggered any time there's been an accusation of sexual assault. 49er GM SAYS McDonald had pattern of poor decision making which could no longer be tolerated. "We as an organization have notified him and his agent that he will be terminated, released immediately, effective immediately," Baalke said. Baalke said he was disappointed at McDonald's behavior off the field. This comes after an accusation of sexual assault. A woman told police she was at McDonald's San Jose home Monday. A local hospital called police Tuesday to report that this patient may be the victim of a sexual assault. Investigators interviewed her and in a police press release, she told them she was possibly sexually assaulted. Police armed with a search warrant went to McDonald's home last night. "They want to seize any bedding or clothing that may have DNA transfer to show a sexual encounter occurred. They're also going to try to establish whether this was a consensual encounter if it occurred," legal analyst Steve Clark said. This is the second time in four months that McDonald has been investigated by the San Jose police. In late August, he was arrested at his home after his pregnant fiancee called 911 and accused him of physically abusing her. Ultimately, prosecutors did not press charges, saying they could not prove the crime occurred. 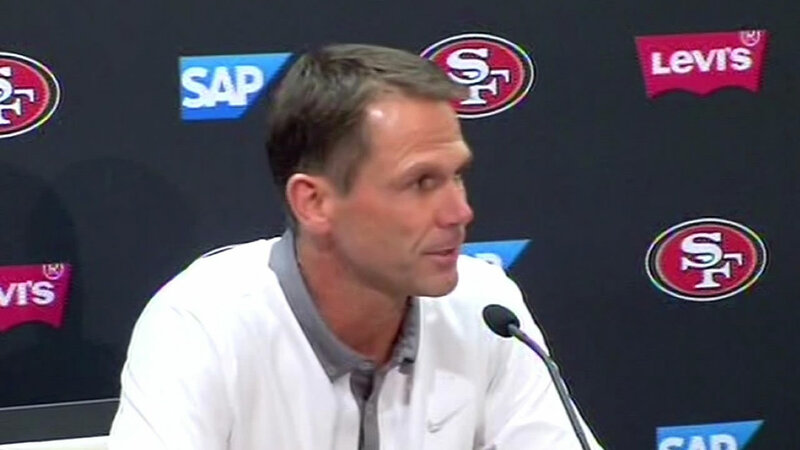 Baalke told reporters the 49ers' decision was based not on guilt or innocence in this case. Baalke emphasized that he had talked to McDonald numerous times about his behavior and even put him on notice. Baalke says he notified McDonald Wednesday morning that he was cut from the team. He has been at his home all afternoon with occasional visitors coming by. One, who did not identify himself, said McDonald was not going to make a statement at this time. Why was McDonald let go so fast? ABC7 Sports director Larry Beil helps explain why the 49ers handled this investigation very differently than the allegations in August. So how did this go down so quickly this time? ABC7 Sports director Larry Beil explains why the 49ers handled this allegation very differently. This time, there was no vigorous defense or any talk of due process. It took the 49ers less than one hour to decide to cut Ray McDonald after the new allegation of sexual assault came to their attention Wednesday morning. McDonald was not charged in the previous case, but it took months of investigating and the 49ers left themselves open to criticism for not suspending McDonald immediately upon hearing the first accusation. In a climate where the NFL has made it clear that any kind of violence against women will not be tolerated, this time the 49ers acted quickly and released McDonald, who had been with the 49ers for eight seasons. "Not angry. I understand the situation. I understand why the team did what they did. Outside that, it's really not my business," 49ers quarterback Colin Kaepernick said. "We had that meeting with the whole staff a couple of weeks ago and I feel like Jed made it pretty clear about how he feels about everything and you've got to go with what the owner says. It's his team obviously and everyone knows what's right and wrong," 49ers linebacker Dan Skuta said. McDonald had started all 14 games for the 49ers this season. The 49ers will host the San Diego Chargers on Saturday night. McDonald was under contract through the 2015 season and seemed to play better once the initial allegations were dropped. At this point, it's hard to imagine any NFL teams willing to sign McDonald going forward.